A couple of years ago I bought a soil blocker with some birthday money. Incidentally, it was way cheaper to get it sent from the US than to buy it in Australia – something like 40% cheaper for exactly the same product made by the same manufacturer. It seems the manufacturer or distributor is not very responsive to Australian retailers, as recently related here, and as a result I haven’t seen many places you can buy soil blockers in Australia. What Does A Soil Blocker Do? Good question! This little gizmo produces 50 mm (2 inch) cubes of seed-raising medium, popping out 4 at a time. 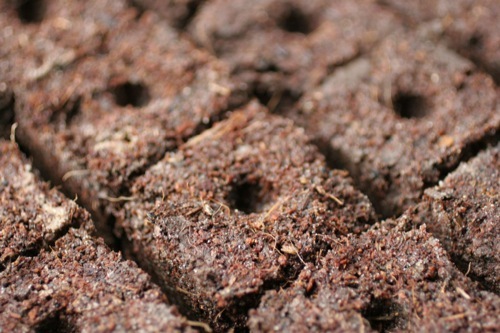 The soil blocks hold themselves together, so there’s no need for seedling punnets. Each block has a little indentation in the top, where you drop in a seed and cover it with blocker soil. The seed will then germinate and grow into a seedling. And this is where the “no seedling punnets” feature comes into its own – when it’s time to plant out your seedlings, you just drop them into little holes in the ground, backfill, and water them in. There’s no root disturbance, no stem damage, and no tearing apart punnets trying to get the seedlings out. They completely avoid transplant shock, which can set seedlings back by up to three weeks when planting out. It’s simple, it’s fast, and it’s really easy to do. Plus you save money not having to buy plastic seedling punnets, only to throw them away after a couple of uses. 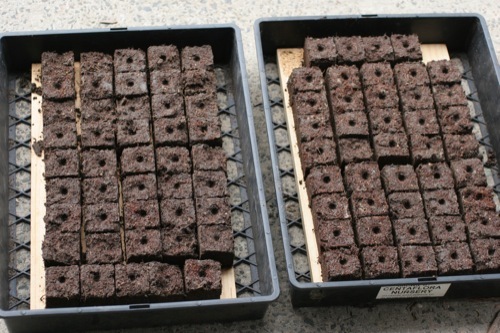 After sowing the seeds, the soil blocks are really easy to look after. I just mist them regularly with a water sprayer to keep them moist, and keep them on shelves in a little mini-greenhouse. Because the soil blocks don’t actually touch each other, any seedling roots that reach the edges of the block will be “air pruned”. So you won’t get a tangled mess of roots growing between blocks and binding them all together. There’s a smaller version of the soil blocker that produces 10 mm (~1/2 inch) cubes, but I haven’t found any reason to want one of those yet. They seem to appeal to cold-climate gardeners, who want to fit as many seed starts onto a heating pad as possible for the initial germination. 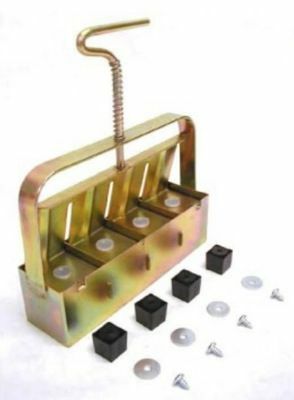 There are a few different plastic attachments available that fit inside the soil blocker compartments to produce different-depth holes in the tops of the blocks. One also creates 10 mm square holes so you can drop your tiny blocks straight into the larger blocks after germination, growing them on to a more advanced stage before planting out. There are also long-handled versions designed to be used from a standing position, known as floor blockers, that pop out up to 20 blocks at a time. These would be great for market gardeners or anyone else needing to plant out many large flats at a time. Update: I’ve posted my own soil blocker seedling mix recipe, as well as links to other variations. You can buy the whole range online at the above site. Soilblockers are a truly great tool that will simplify your seedling production and give you super healthy and hardy plants.